Food waste conversion to biomethane is now within the reach of four cities across Europe, thanks to work conducted under the Bin2Grid project. The 88 million tonnes of food wasted every year in the EU cost the trifling sum of EUR 143 billion. With that in mind, it's easy to understand why food waste valorisation has become a political priority. New concepts and technologies keep emerging on a regular basis, notably thanks to EU funding under Horizon 2020. Bin2Grid is one of these initiatives. 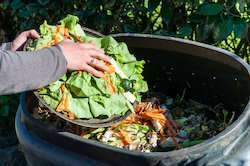 For two years, the project promoted the segregated collection of food waste, its conversion to biogas and the latter's upcycling into biomethane. The point? Supplying local fuelling stations in the cities of Zagreb, Skopje, Malaga and Paris, and help make biomethane a more sustainable alternative to fossil fuels. "None of these target cities had implemented the concept of waste-to-biofuel prior to Bin2Grid," says Bojan Ribić, coordinator of the project on behalf of Zagreb City Holding. Drawing inspiration from pioneer cities like Barcelona, Lille and Vienna, consortium members recommended specific activities to decision-makers; issued reports, guidelines and feasibility studies; and provided examples of best practices. In Paris, for instance, the project found that biogas implementation had been accelerating lately, pushed by national objectives and ambitions to ban diesel fuel altogether. However, the consortium deplored among other things the limited number of refuelling stations, their lack of interoperability, limited car buying options, and higher maintenance cost. They concluded that new partnerships between stakeholders to better balance supply and demand – along with other measures such as a favourable tax regime – could considerably boost the sector and worked hard to make them happen. "The concrete implementation of our proposed solutions at the local level was one of the main challenges we had to face. To overcome this challenge, we included all relevant value chain stakeholders in the development of our concepts, from inception phase until the end of the project," Ribić points out. Two key sectors were specifically targeted: waste management and renewable energy production, with the aim of bridging existing gaps between the two. The consortium analysed existing technologies related to biowaste separation and treatment, biogas production and upgrade, as well as biomethane utilization. Then, they investigated possible economic tools to increase the profitability of the proposed concept. "Our dedicated tools can assist stakeholders in the setup of sustainable waste management combined with renewable energy production in local communities. One example is an Excel-based benchmark tool which compares organic waste in the biomethane value chain with other waste treatment value chains such as landfilling, composting and incineration. This tool was already applied to seven cities," Ribić explains. Moreover, the project's biomethane tool – which provides an idea of economic conditions around biogas production, gas upgrading and utilisations of biomethane – can be used to estimate investment, operating and initial of costs of different facilities. All in all, the project has significantly contributed to ongoing discussions on how to make the waste sector more sustainable at the international, EU, national and local levels. Now that it has come to an end, consortium members plan to keep disseminating project outcomes and results. "We strongly believe that our proposed concept is the most sustainable solution regarding for the management of biowaste and its usage as a biofuel," Ribić says.